In the fashion industry, it’s all about being ‘on trend’. But what that means is changing. Today’s fashion consumers are finding, sharing, buying and researching brands in completely new ways. 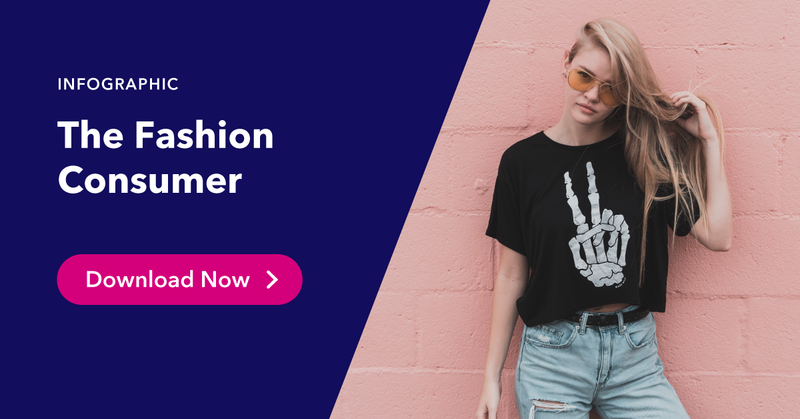 Our research identifies 13% of internet users as fashionistas, meaning they have a strong interest in fashion, have purchased clothes in the last month and like to keep up with the latest fashions. For retail brands targeting this complex group, reaching them means developing a deep understanding of everything from what they do, to how and why they do it. Here’s what our latest research says. 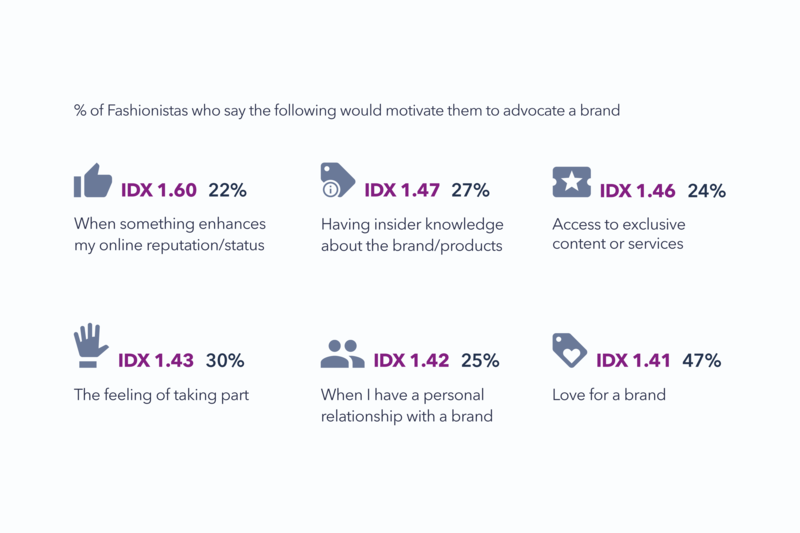 Fashion lovers are keen to be brand advocates. 85% say expressing themselves is an important reason to use the internet. They’re 1.4 times more likely to want to stand out in a crowd. As a group, fashionistas are image-focused. 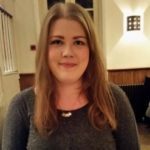 They’re outspoken and keen to express themselves and their views. Since they’re also not afraid of standing out in a crowd, they’re perfect recruits for brands looking to onboard brand advocates. So what would entice this group to shout about a brand on their ever-important social media feeds? Above all else, fashionistas can be encouraged to advocate a brand simply out of love for the brand, and feeling like they’re a part of its journey. Offer them transparency into your story and build personal relationships based on insider knowledge and exclusive access, and you should have eager, switched-on brand advocates. Target female fashionistas – but don’t forget their male counterparts. 67% of fashionistas are female, 33% are male. When you hear the phrases “fashionista” or “fashion fan”, male consumers may not instantly come to mind. But it would be a huge mistake to leave this audience behind. Our data shows that a whole third of fashionistas are, in fact, male. This means any brand looking to squeeze the most out of this audience would do well to include male consumers in their product range, advertising and relationship-building. Broadcast TV is a crucial channel for brand discovery. The fashion industry has been accused of being late to adopt new technology and invest in online efforts. 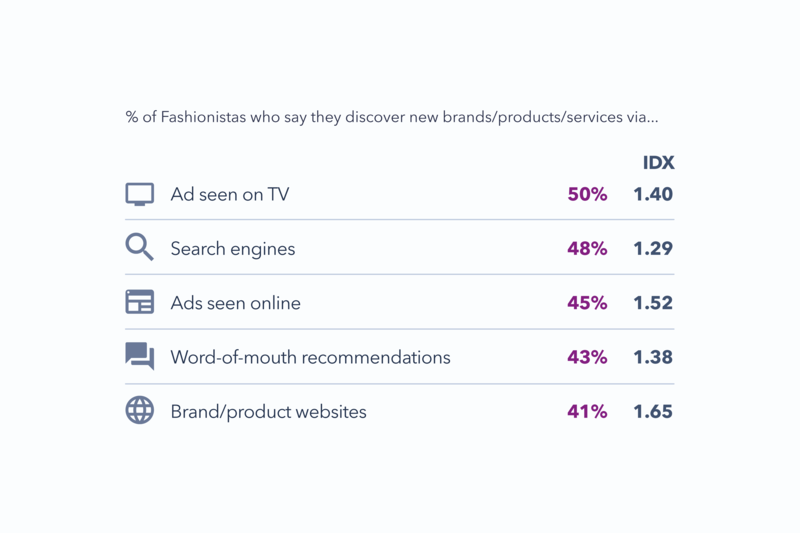 Our research shows that TV ads, seen as a traditional marketing channel, actually score highest among fashion lovers, with half saying it’s their main source for discovering new brands, products or services. In the same vein, 43% rely on word-of-mouth recommendations, meaning brands would do well to invest in their reputation and fan-building. However, these “offline” brand discovery channels are closely followed by search engines, online ads and brand websites, underlining the importance of having a wholesome presence to be seen where fashion consumers are. They love to communicate with brands via social media. Fashionistas are 79% more likely to share a brand’s post on social media. 1 in 5 upload photos/videos to brands’ social pages. It comes as no surprise that fashion lovers are keen social media users – they spend an average of 3 hours per day on social networks. But they don’t just spend this time mindlessly scrolling through their feeds; in fact, this audience is highly active on social. Being 79% more likely to share a brand’s social media posts presents a key opportunity. By creating optimized content and having a well-developed presence on the platforms that matter, such as fashionistas’ favorites YouTube, Facebook and Instagram, and top-indexing Snapchat, brands can encourage engagement from this group. But that’s not all; 1 in 5 fashionistas also upload their own photos and/or videos to their favorite brands’ social network. This means not only can brands with a strong, consumer-centric social presence benefit from this audience’s eagerness for engagement, but also encourage user-generated content that will enrich their feeds. Social commerce is on the rise. Fashionistas are 49% more likely to use social media to research or discover products to buy. They’re nearly twice as likely to follow brands they’re thinking of buying from. 16-34 fashionistas are 1.7 times more likely to be driven to purchase by ‘buy’ buttons on social. Social commerce has struggled to take hold in the West, while enjoying rapid success in Asia in particular. But fashionistas are primed and ready to join the social commerce movement. The insights speak for themselves. Social ‘buy’ buttons, famously difficult to nail down successfully, are attractive to this audience, who are also twice as likely to follow brands on social ahead of buying one of their products. Being 49% more likely to use social for product discovery and research before making a purchase also presents an opportunity for brands to commercialize their social networks more than they may have done before – and to start experimenting with that ‘buy’ button. Fashionistas primarily use mobile devices for online commerce. Last month, 73% bought a product via mobile – 23% more than via PC/laptop. 1 in 4 sold a product via mobile, making them 25% more likely to do so. They’re 49% more likely to have used a mobile payment service, at 53%. For this crowd, their mobile device is extremely important, and they use it for most of their online commerce behaviors. They’re 50% more likely to use their mobile to make a purchase than their PC or laptop, highlighting a desire to do their shopping on the go. It naturally follows that they’re more open than most to using mobile payment services to aid their speedy commerce; 53% did so last month. With this in mind, retail brands looking to target this strong-minded bunch should ensure their mobile experience is on point, and their checkout process is quick and pain-free. Reaching fashion consumers in 2019. Fashionistas are always the first with the latest – and their online and brand behaviors are no different. Our latest research reveals a group who know what they want and how they want it, eager to engage with brands and be part of their story. This opens up a multitude of opportunities for retail brands to reach fashion consumers in 2019, encouraging meaningful and lasting brand-customer relationships on social media and beyond.